Red and White Coachwork. Comes fitted with a 24 litre top box. First service has been carried out. Previously supplied by ourselves. One owner from new. Excellent condition throughout!!! Only £1995!!! Finance available subject to T's & C's. All major debit and credit cards accepted. Please note that all of our stock come with a multi point health check, PDI service & road test, MOT and a 3 month warranty. 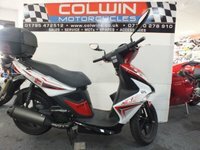 Visit our website for loads more bikes and scooters!! !